About 80 public school teachers piled onto a pair of buses Tuesday afternoon in suburban Chicago heading to a Sikh Gurdwara – meaning “door to the Guru” or a place of worship – in the village of Palatine. Once there, the group immersed itself into the religious culture. 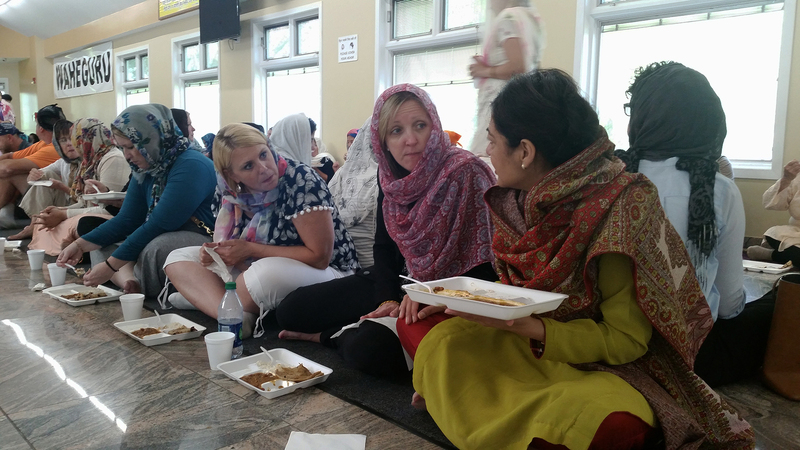 They donned traditional headcoverings, partook in “langar” – a vegetarian communal meal of rice, beans, curry and bread eaten while sitting on the floor in a sign of equality – toured the Gurdwara building and took in hymns and passages from the Sikh holy book, the Guru Granth Sahib. The site visit was one of several planned this week for Chicago-area public school teachers participating in a pair of weeklong religious literacy workshops led by two of their suburban colleagues. Brady and John Camardella, a teacher at Prospect High School, have each spent the past dozen-plus years teaching world religion electives in their respective public schools. That’s not teaching religion itself, of course – that's outlawed within public schools by the U.S. Constitution – but rather an examination of various religions and their roles in the world and its history. The National Council for the Social Studies for the first time added a supplement to its College, Career and Civic Life Framework last month, adopting guidelines for the academic study of religion in K-12 public schools written in collaboration with Brady and Camardella. That framework stresses an analytic approach, allowing students to gain an awareness of world religions without forcing acceptance or practice of any particular faith. In addition to Camardella and Brady, the writing team that outlined that rubric included educators from the Harvard Divinity School, the Newseum Institute and Rice and Georgetown universities. The two men applied for and received a $15,000 grant last summer that’s being used this week on a pair of religious literacy courses they’re offering to their teaching colleagues. The syllabus includes lectures from religious scholars and site visits to houses of worship such including the Sri Venkateswara Swami Temple in Aurora, the Baps Shri Swaminarayan Mandir in Bartlett, and on Tuesday, the Sikh Gurdwara in Palatine. One of the reasons Jenny Hodonicky, a reading specialist at Ellsworth Elementary, signed up for the course was to “build that empathy for others and just that understanding to help them also foster empathy for others. Julie Groves, a third-grade teacher at Ranch View Elementary in Naperville, described the experience as twofold – seeing a split between her own desire for knowledge and the need to better connect with an increasingly diverse student population. That’s the goal, according to Brady. He isn’t expecting every teacher taking part in the workshop to start up their own religious studies course in their schools. Instead, he hopes the new guidelines and personal experiences allow educators to find spots within their existing curriculum to expand religious literacy. At Prospect – a school of about 2,200 students located just over 20 miles from downtown Chicago in the village of Mount Prospect – Camardella teaches his religious studies course to about 140 students per semester spread across five daily class periods. Interest has ballooned to the point where the school must maintain an ongoing waitlist for students who want to enroll in the elective. Camardella has even launched a weekly Thursday night course for parents to answer questions and dive deeper into the same concepts their children are learning in the classroom. June 12: Students at Roger C. Sullivan High School will share stories of community and identity from local and international perspectives this week, in collaboration with Lifeline Theatre. June 8: How do the city’s halal restaurants, which serve mostly Muslim customers, hold up during the month of Ramadan? We explore the traditions of two West Ridge destinations. May 22: Nearly 40 countries are represented at Sullivan High School in Rogers Park. We meet the head of the school’s English language program – and the reporter who recently wrote about the school.